See “Our Dogs” tab for photos, more info, and health testing on the parents. Previous puppies under “testimonials” tab. Welcome, we are Alyson and Katy, two sisters with a focus on producing exceptional family companions. Our Goldendoodles, and AKC Standard Poodles are a part of our family, well socialized with our children and friends, and get lots of love and attention. Our goldendoodle and standard poodles puppies go home up to date on their shots, de-wormed, and a puppy pack to get you started. We offer a health guarantee and contract. Please be ready to make a 10-12 year commitment to your new family member. We welcome any questions you may have about our goldendoodle puppies or standard poodle puppies, so please contact us! F1 English Creme Goldendoodle Puppies! Follow Us on Facebook for the latest updates and photos on our litters and when we are expecting our Goldendoodle puppies and Standard Poodle puppies! Email us at love4oodles@outlook.com to be put on our email list for the latest litters. 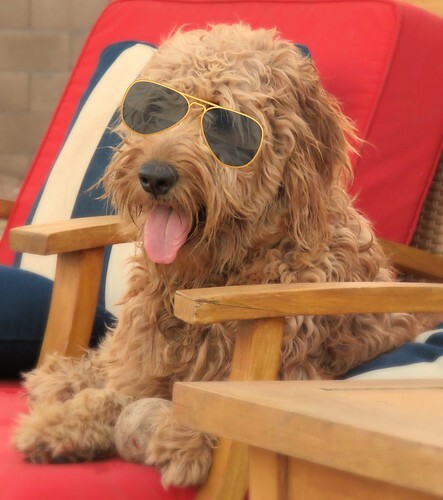 F1B Goldendoodle Puppy all grown up! Cinnamon. 2 year old F1B Goldendoodle Puppy. Love the fact that this site is about animals in a SECURE environment, not puppy mills and pet shops. Dogs need to be free like us, yes they are a different species than us but close than any other animal to us other than cats. We are located in Arizona. We are able to ship our puppies safely through United Airlines Pet Safe program or American Airlines, who just won their fifth consecutive International Cargo award. It generally costs $350-$450 depending on the destination and size of dog. The shipping includes a vet check and certificate that the puppy is in good health and able to fly. Great! My little sister always wanted a poodle for herself. I’ll be considering getting one to these for her birthday the next month 🙂 Great site! Do you guys provide training and products? Thanks for your comment! We have a litter of AKC Standard Poodles right now! We are currently taking deposits to reserve your puppy now. They are ready to go home in July. Our prices remain competitive even with an additional shipping cost. We provide basic puppy training such as potty training. Our puppies go home with a puppy pack – a large sample of their food, puppy treats to encourage positive reinforcement training, a chew toy, and their health record. I can tell from viewing your website that you just love them, it’s not just about selling animal stuff… and I know this will make a difference for your visitors! Well done, give the little fur balls a huge hug for me!!! Thank you Sarah, our family enjoys our goldendoodle, labradoodle, and poodle companions. They each have a great personality! Our kids love playing with the dogs and puppies they in turn chase them around the yard. Well, if you ever have any questions about dog breeds or getting a puppy let us know. Thank you. Love your website! It’s very informative and I love your pictures. Your dogs look healthy, beautiful, and happy. When I’m ready for my next puppy, I will definitely choose love4oodles. It’s important to me to get a puppy from a reputable family breeder. Glad I found you! Thank you Janine, we have some good tips and answers to FAQs on this website. If you would like us to write about something specifically please let us know. Thanks again! How do your dogs get along with other dogs? We have a 3 yr old boxer and are thinking about getting a sister or brother for her. She loves to play and is well-tempered. Obviously we’d want to create the best transition possible for both – what do you think? These are some of the most beautiful Goldendoodles I have seen! Beautiful and the best personalities. Congratulations on your gorgeous dogs. We bought Lucy our F1B goldendoodle from Alyson in 2016. We chose Love4oodles after visiting other breeders in Arizona. We loved that the puppies and parents were obviously being raised indoors, w a family that had small children and other pets. The dogs were socialized and loved and thus Lucy has been a dream pet. Lucy was *so easy* to potty train, has never had any behavioral issues (unless you count eating cotton balls?) and everyone who meets her falls in love. Lucy is drawn to kids and just loves to be petted and played with. We simply adore her. Were we to ever buy another dog, we wouldn’t consider any breeder other than Love4oodles. Thank you we are happy to hear Lucy is doing well and well loved!